1. Preheat the grill to high. Put the aubergine slices on a baking sheet and grill for 6-8 minutes on each side until browned. 2. Meanwhile, place the tomatoes in a bowl with the oil, garlic, mint and chilli. Mix together and season, adding the aubergine when cooked. 3. Cook the spaghetti according to pack instructions. Drain, reserving a cup of the cooking water. 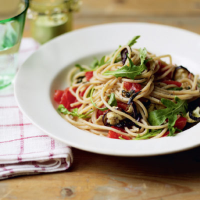 Return the spaghetti to the pan and stir through the aubergine and tomatoes, adding enough cooking water to give it a silky texture. Season, stir through the rocket and serve.